You might have been receiving this like rumor in the past, but it is no more a hearsay. 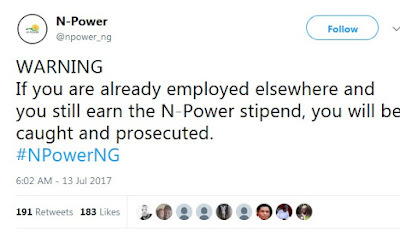 Npower has started sweeping out beneficiaries who are already engaged with government jobs or private ones. Are you an existing Npower beneficiary who is already working somewhere else? This may be one of the disheartening updates but it can as well save you from unnecessary embarrassment and hands of law. If you want to know what will happen if Npower finds out you’re already working with any of the arms of the government or private company but you’re still earning their stipends, this is a must-read for you. 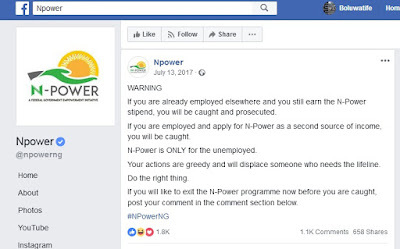 Npower has since the beginning of the scheme in 2016 warned all beneficiaries from earning from two sources especially form government and companies. This warning may not extend to those applicants who were self-employed earlier before or after they are engaged in the scheme. For example, in 2017, the support team released such awareness on their social media channels inclining Facebook and Twitter. 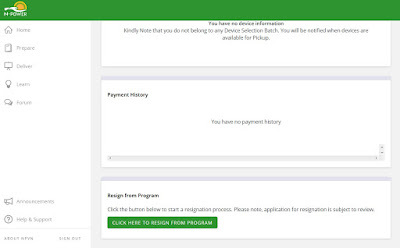 For clarification, the support team warned against using Npower as the second source of income. 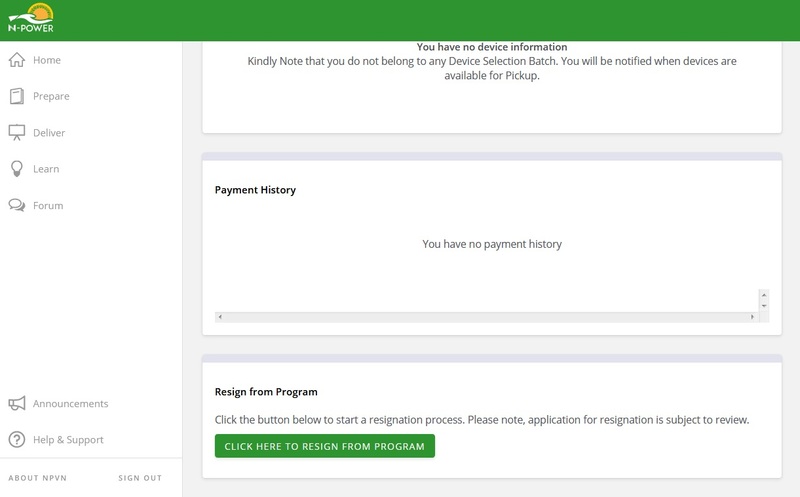 As of 2017, any applicants who wished to exit the scheme would have to send messages to the support team or comment below such warning to get out. How would they know I’m working Elsewhere? Well, a simple way to know is if you’re working with any government establishment. It’s the same Federal Government paying for all her workers. Hence, you’re out of your hiding if your names tally on another payroll with that of Npower’s. This is equally applicable to the state or local government payrolls. Don't forget Federal government has unquestionable access to them too. 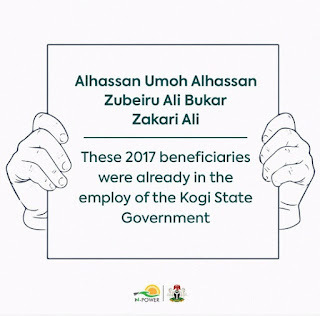 And if you’re working in the private sector, don’t forget the Federal government now has access to your BVN which gives all information about you and your employment or working status. They can just trace each applicant to his or her BVN and get you caught. You may be lucky, however; if you’re just self-employed or you don’t have your BVN registered yet or no working information with it (which I doubt). Just recently, September 27, 2018, the support team released names of three people already caught. They released the names and warned others along. 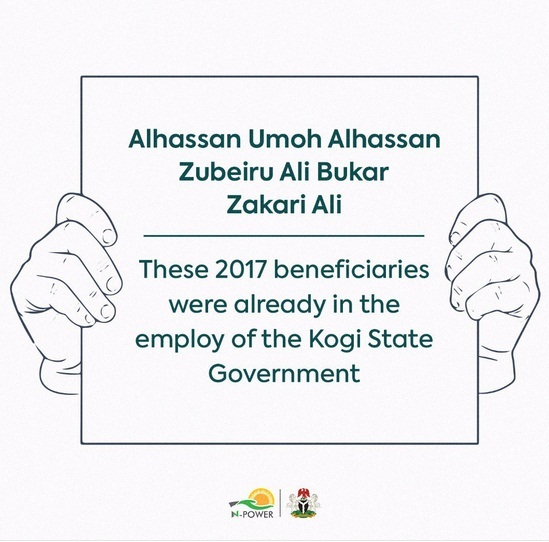 We have warned 2017 Beneficiaries in employment elsewhere to exit the N-Power programme but it appears many think we are joking. We have begun sweeps and will find out the fraudulent ones. Anyone caught will be exited from the programme and reported to the Police. As earlier said, the team had started the sweeping process. They have already caught some people and these beneficiaries may be handed over to the police any time sooner. Who knows the next beneficiaries to be caught?